FREE delivery above 1m3 (or 20 nets) within the M60 ring road! We may be able to accommodate free/discounted delivery for smaller orders, especially if you have mobility or transport issues and can’t pick up bags from your local retailer so give us a call to discuss. Unseasoned Sale 2019 – from 1st April 2019 to 31st May 2019, get 10% off loose unseasoned firewood! All prices inclusive of VAT and delivery within M60. Smaller orders: we only deliver orders from 1m3, but you can collect nets from our Yard by appointment (please call or email us to arrange!) or see the map of our network of retail outlets. Bulk deliveries: up to 45m3 by agreement – contact us for discounted price. Netted Kindling: Available through our network of retail outlets and on online. Wholesale firewood: We supply wholesale logs and kindling to our network of retailers – ring us to discuss your shop requirements. We are VAT registered. 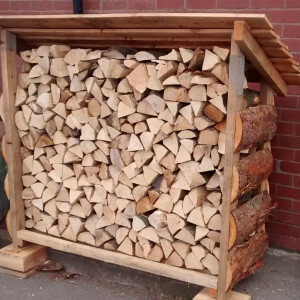 Bespoke firewood: Get in touch to discuss your specific requirements. Swedish logs: Available on online. Firewood storage shed: Available on online.